Heat illness or more correctly heat-related illness is a broad term to describe any disturbance that arises in the body as a result of heat. It is commonly known as excessive body heat or hyperthermia. As the temperature rises there are various symptoms that will be seen as a result of the heat. There are many different forms of heat illness and the symptoms may vary but the most extreme type, heatstroke, is potentially life threatening. Every year heatstroke causes the deaths of thousands of people across the world. It is more likely when there is a heat wave in a place where people are not accustomed to dealing with uncharacteristically high temperatures. Death is more likely in babies and the elderly. The inside of the human body needs to be around 37 degrees Celsius (C) or 98.6 degrees Fahrenheit (F). However, this is the ideal body temperature and the reality is that the temperature can fluctuate slightly and still be considered normal. The body functions optimally within this normal temperature range for humans meaning that all the organs, tissues, cells and chemicals are able to maintain a state of balance in the normal temperature range. The medical term for this normal body temperature is normothermia. When the body temperature is too low then it is known as hypothermia (hypo ~ less or low) and when it is too high then it is known as hyperthermia (hyper ~ more or high). The body has several ways in which it controls the internal temperature and maintains it in a normal range. This is known as thermoregulation. Blood vessels in the skin widen (dilate). We see this as reddening (flushing of the skin). Water loss through the urine is limited. We see this as less urine output and dark yellow urine. Increased blood flow to the skin allows heat from inside the body to pass out into the environment. This is helped by the sweat on the skin surface that evaporates thereby carrying the heat into the air. The body conserves water in urine so that it will have sufficient water to produce sweat and pass it out for a longer period of time. Hair on the body surface stays down so that any wind passing on the skin surface can travel easily and help with cooling. All these mechanisms help to keep down the body temperature. However, in some cases these measures may be insufficient to cool the body. Alternatively, these measures fail to take effect because there is a problem with the body’s temperature control centers. The temperatures inside the body then continues to rise eventually reaching a point where the heat is excessive. Simultaneously, the body loses large quantities of water and electrolytes (salts) and the internal balance is further disrupted. At this point it starts affecting normal functions in the body and this is known as heat illness. The two main ways in which most heat illnesses arise is with hot weather and a fever. There are several other causes and risk factors that may also be responsible. If the weather is extremely hot or a person is working in a very hot environment, the body’s cooling mechanisms may not be sufficient and heat illness will arise. This is made worse when people work outdoors or undertake strenuous activities like sports during very hot conditions. A fever usually occurs when there is an infection. The body’s temperature control center is altered and the temperature within the body rises. Shivering causes more heat to me generated. Normal mechanisms may either not be effective or does not work as it should allowing for the temperature to keep rising. Obese people have more fat under the skin (subcutaneous fat) . This fat acts as an insulator preventing the body from losing heat through normal temperature control mechanisms through the skin surface. Certain medication can raise the body temperature by increasing the metabolism. Energy production also means heat production. Other medication may affect the normal temperature control mechanisms like the blood flow through the skin surface and even the degree of sweating. Drugs can cause water loss and impair the thirst sensation so that less water is taken in leading to dehydration. Certain common chronic disease like diabetes mellitus and heart failure hamper the normal temperature control mechanisms in different ways. Cancer also have this effect and even contribute to a fever despite there being no infection. The body is used to temperatures within the environment where one lives. When there is a heat wave or a person suddenly travels to a hotter environment, the body may not have time to acclimatize. Heat illnesses are therefore likely to occur in these cases. Babies and young children are the most prone to heat illness. Their body is not accustomed to dealing with high temperatures mainly because of size. All humans irrespective of age need to maintain a normal body temperature around 37 C (98.6F). To prevent excessive body heat, the body passes it out through the skin surface. Babies and children have a smaller surface area since their bodies are smaller. This means that their body has less space to pass out heat into the environment compared to the larger bodies of adults. Therefore temperatures can rise faster and drop slower in babies and children thereby leading to heat illnesses more easily. They also have a higher metabolism (more energy = more heat) and may not sweat sufficiently for adequate cooling. Another problem is that babies and young children may be unable express or understand their intense thirst and are less likely to rehydrate themselves if there is no adult supervision. Age often brings about an impairment in the temperature control center. The body of an elderly person is therefore unable to take the necessary measures as the temperature rises above the normal range. The elderly are also more likely to be using medication or have chronic diseases that can affect normal temperature control. Sometimes the elderly may not be able to access sufficient cooling aids such as fans or air conditioning due to physical disabilities, financial constraints or mental health problems that affect thinking. An impaired thirst sensation may also not alert them to the need to drink more water. For these reasons, the elderly are more at risk of heat illnesses and their body is often not able to deal with the effects often leading to death. There are various different types of heat illness which may affect only parts of the body or the entire system. Heat rash where fine pimple-like bumps appear on the skin (miliaria or prickly heat). Heat swelling (edema) is swelling of the hands and legs due to heat. Heat syncope where a person faints from the intense heat. 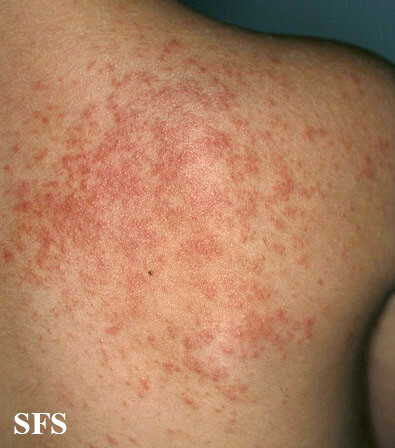 Picture of heat rash (miliaria) from Dermatology Atlas (Brazil) courtesy of Samuel Freire da Silva, M.D. These different types of heat illness can be seen as stages of worsening body heat excess. First it starts off as heat cramps, progresses to heat exhaustion and finally heat stroke. However, it is difficult to clearly determine when one type of heat illness moves to the next stage as such because there are several common symptoms. Heat cramps occur when the body has lost a significant amount of water and electrolytes mainly through sweating. Sometimes diuretic medication (water pills), alcohol and caffeine can also worsen this water loss. As the name suggests, there is brief periods of painful muscle cramping and twitching. Heat exhaustion is a more severe form of heat illness than heat cramps but milder than a heat stroke. The effects of heat illness at this point affects many systems in the body and a low-grade fever may develop along with heavy sweating, nausea, fatigue, lightheadedness and dizziness. The body is unable to cope with the excessive heat and is signaling an upcoming point where there will be irreversible damage. This is the most severe form of heat illness as the temperature rises above 39.5 C (103 F) and once the internal temperature reaches 41.1 C (106 F). At this point the body is in severe distress from the continued and rising heat levels. Sweating stops at this point and what little temperature cooling mechanisms were in place begins to fail. The brain, heart, kidneys and muscles shut down and become damaged, sometimes even permanently. Death occurs soon thereafter if treatment is not commenced. Profuse sweating which is beyond the degree of sweating that would be expected. Extreme tiredness (fatigue) and weakness. Rapid pulse that is weak (feeble). Nausea which may be sometimes accompanied by vomiting. Red flushed skin that is hot to touch and dry or moist. Rapid pulse that is strong. Heat illnesses can be diagnosed by taking the person’s medical history and the findings of a clinical examination. The vital signs are often abnormal as described above. The body temperature is either slightly above or well above the norm – hyperthermia. The electrolyte levels in the blood are assessed as dehydration affects the normal concentration of these salts and chemicals in the body especially sodium, potassium and phosphates. The blood pH and blood glucose levels may also be abnormal. The breakdown of muscle (rhabdomyolysis) can be detected by monitoring the levels of creatinine kinase, aldolase, lactate dehydrogenase and myoglobin. Liver function tests may be abnormal and urea and other waste levels increase as the kidneys shut down. The urine will appear much darker than normal partly due to the lack of water in the urine and also with the presence of certain proteins. Muscle proteins and blood may be detected in the urine. When this correlates with the abnormally high levels of wastes in the bloodstream, it is an indication of the kidneys malfunctioning due to the heat and dehydration. An X-rary. CT scan (computed tomography scan) and MRI (magnetic resonance imaging) may show damage to the internal organs as the condition worsens from heat exhaustion to heat stroke. One of the most important components of treatment of heat illness is rehydration. If a person is conscious and not nauseous or vomiting then water and oral rehydration solutions (ORS) can be drank constantly until the water and electrolyte levels restore. A person should be taken into the shade (out of the sun) and placed in a cool room. As much of the clothing as appropriate should be removed. Wetting the skin with compresses or wet sheets and air conditioning may help lower the body temperature. Ice should not be applied directly to the skin. A person may need to be immersed into cool or ice water but this should only be done under medical supervision. Symptoms of a heat stroke may be controlled separately with medication. An IV drip may need to be set up for a person who is severely dehydrated, vomiting, confused or unconscious to replace water, electrolytes and glucose. Oral rehydration solutions can later be given through the mouth once a person is in conscious and not vomiting. Water alone is not sufficient as the electrolytes also need to be replaced. A simple bland diet should be commenced once the person is in a better state and if hungry. The prevention of heat illness is more a matter of common sense that specific medical measures. Wear lightly colored and loose, airy clothing in very hot temperatures. Stay out of the sun as far as possible and take regular breaks if forced to work in the heat. Constantly drink water and preferably oral rehydration solutions. Avoid caffeine and alcohol which may worsen the dehydration. Babies, young children and the elderly need to be monitored closely in very hot conditions. Rest as much as possible and limit the amount of time working outdoors in the the and sun. Take note of the early signs of heat illness and stop any physical activities immediately.